Like the rest of the world, the architects of MKC were shaken and troubled by events in Paris yesterday. As the evening darkened, and the skies remained lit by an amber glow of a thousand years, the implications of what had happened began to hit me harder and harder. As many architects do, I first visited Notre Dame during a study abroad semester in 2007. In spite of almost 6 months of travel, and hundreds of churches visited, the cathedral of Notre Dame impacted me to my core. It wasn't only the buildings ornate monumentailty, nor the glowing darkness of its vast interior; rather its stance within a larger public arena made its largest impression. The crowds of people, tourists and Parisians alike, shared the public square in the shadow of its overwhelming towers. People and architecture cohabit one another - we share experiences with buildings just as much as they share their presence with us. Notre Dame wasn't a mere building, however, but a true edifice of the human past. It belongs to all that is great in humankind. A part of all of us, it is an art of the human race. And that is why yesterday's fire was so tragic to all of us. Perhaps my mother, when the spire collapsed, said it best, "I'm crying over the loss of a building." To the cathedral of Notre Dame, thank you for nearly a millennium of memories. May you rise from these ashes like a Phoenix reborn. Rachel Ghindea and Matthew Teismann of MKC Architects are scheduled to speak at a conference in Belgium in late March 2019. The conference is titled Displacement and Domesticity. As national leaders in student housing, this conference is an opportunity for MKC to showcase two key themes of students living away from home: Displacement & Domesticity. Displacement connotes a sense of being uprooted. When people are displaced, it involves instability and invokes strong feelings of unfamiliarity, even homelessness. Domesticity, in contrast, implies certain stability and familiarity; a rootedness or sense of being grounded. Applied to the building and adaption of architecture, domesticity refers to the material and spatial practices that are considered indicative of the makings of a home. Rachel and Matthew are approaching the challenges of displaced living from an oblique angle. Titled ‘Living Within the Absurd: Albert Camus and Social Estrangement’ their paper will analyze the affects of detachment and abstraction through the writings of Nobel Prize Winning author Albert Camus. Albert Camus’s writing are biographical descriptions of domestic and urban space that provide a stage on which characters become exiled from society which surrounds them. Emblematic of an absurd incongruence between life and the world, his writings portray an abstraction of architecture in vast African cityscapes. An analysis of displacement present in Camus’s writings, this paper interrogates episodic architectural instances as described through Camus himself. Inspired by Albert Memmi’s work on post-colonial theory, and Esra Akcan's melancholy of colonialism, this investigation will deepen relationships between the colonizer, colonized, and domestic space. Living in a displaced world, Camus abstracts himself, and subsequently the characters in his novels, from the reality of these environments. An analysis of societal displacement present in Camus’s writings - in particular La Peste [The Plague], L'Étranger [The Stranger], and Le Premier Homme [The First Man], this paper analyzes episodic architectural instances through the lens of Camus’s notion of home. What can the analysis of a particular author tell us about the relationship between literature, colonialism, and architectural spaces of domesticity? How does Camus’s philosophy of the Absurd impact an idiosyncratic narrative and its memory? Most importantly, how does one’s sense of home affect the way they cognize and abstract the reality around them? For more information on Matthew and Rachel, click here. 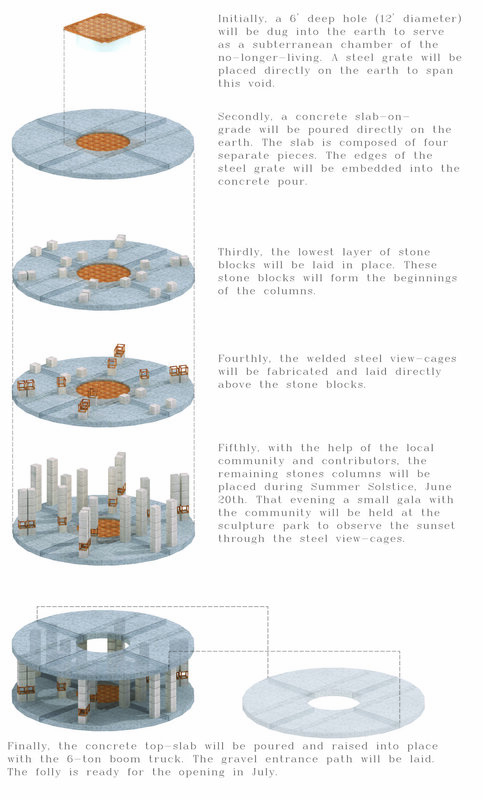 In celebration of Vernal Equinox, and the re-emergence of Spring, MKC would like to offer a how-to manual of sorts - “How to Build a Stone Circle”. Building upon the ancients, this modern interpretation of stone circles - such as Stonehenge and the Ring of Brodgar - is a means through which to observe cosmological phenomena. Days such as Vernal Equinox provide unique opportunities to reflect on humanity’s place, not only on earth, but throughout the cosmos. In some of these ancient buildings reside certain existential characteristics - aspects of the object - that heighten the awareness between human and cosmos. They, along with others, were the origins of archetypes. Timelessly contemporaneous, they are places that offer a combined vantage point into the universal beginnings of cosmological architecture. The artifact depicted here strategically reveals such Earth/Sun alignments. Like all types of great architecture, it offers a chance to consider our existence. Time (Earth) - Human’s concept of time has varied through the ages based on the cosmology of the era. In most instances, however, we measure time based on our human experience of events on earth: our role is constant. Thus, if humans do not perceive, but rather participate in, a unified world of experience, humans are also in a perpetual state of becoming. Like the earth, we are becoming as one. Scale (Mortal) - Man measures himself through the gods. Disproportionate use of scale in architecture lend credence to the realization that man is merely a finite mortal piece of the cosmos. Similar to Gaston Bachelard’s writings on the miniature, when viewing extremely large objects, we feel humility. One example of such a utilization of scale is the ancient burial tombs at the Maeshowe Cairn in Scotland. Light (Sky) - Perhaps the most direct and prominent expression of cosmology in architecture is the poetic and prescriptive use of light. The multiple structures at the Hill of Tara exemplify the alignment with celestial bodies to emphasize man’s connection with the cosmos. Ordered Geometry (Divine) - As humankind’s perceived relationship with the cosmos has changed over time, so has architecture’s expression through geometry. For example in the stone circles of Callanish Stone Circles, we find a direct correlation with the horizon and that which lies beyond, both in the physical layout of the structure, but also its relationship with the divine bodies above. Our folly depicted here, an architectural construct of cosmology, is unique insofar as it is a retrospective look at ancient architecture - taking what we know in contemporary thought and applying it anachronistically to uncover new truths about the past, and thus, the present. By comparing contemporary thought and ancient object, newfound similarities may emerge between two seemingly disparate topics. Regardless of time or era, these similarities have been present in the human psyche since the dawn of man. These are cosmological archetypes. MKC Architects recently announced changes to its management team. The Board of Directors have adopted an organizational plan to move the 95-year firm to the cutting edge of design firm management with a focus on client services. Our corporate framework enables us to implement strategies through the firm’s greatest asset – it’s people. This new structure will enhance the resources we have to take on new challenges and succeed. We are excited to announce Todd Wrobleski, AIA as the President of MKC Architects. In addition to continuing to oversee the firm’s financial strategy, Todd will be responsible for providing leadership, direction and management for all aspects of the firm. A 33-year veteran with the firm, Todd joined MKC as an intern upon graduation from Ohio State University with a degree in Architecture. He has served as an Educational Studio Director, and as the firm’s Chief Financial Officer. Todd has worked on over $2 billion worth of MKC Architects projects during his tenure. MKC Architects has an immediate opening for a Senior Architect in Columbus, Ohio. We are a progressive design-oriented office, with a diverse portfolio of work and collaborative atmosphere located in the heart of Ohio. We are seeking applicants with 8+ years professional experience and has a technical focus responsible for significant project activities. The successful applicant will be able to demonstrate critical thinking and problem solving creativity while preparing documentation for delivering public and private commercial architectural projects. Moreover, this person will have experience working with out-of-house MEP and Structural consultants, strong technical / design documentation skills, and be capable in all phases of project delivery. Working literacy and capability in Revit is required. Candidates need to be able to work in an office that has a casual culture with a team approach. This is a position for a licensed architect where individuals will be exposed to a variety of projects including institutional [university, library, museum, K-12], student housing, health care, and other commercial projects. The successful candidate will be a thinker/doer/manager, charged with leading the project and undertaking tasks associated with the full range of architectural project delivery. The Architect’s role and responsibilities include being the primary technical person responsible for creating the deliverables for a given project, directing project teams of 1-3 members’ work, coordinating with consultants and managing many areas of project delivery, from conceptual design through construction. •	Creativity desired - passion a must. MKC Architects is proud to provide our employees the opportunity to work on a variety of exciting and challenging projects. MKC Architects offers excellent benefits and compensation commensurate with experience. MKC Architects has an immediate opening for a Project Architect in Columbus, Ohio. We are a progressive design-oriented office, with a diverse portfolio of work and collaborative atmosphere located in the heart of Ohio. We are seeking applicants with 5+ years professional experience and has a design & technical focus responsible for significant project activities. The successful applicant will be able to demonstrate critical thinking and problem solving creativity while preparing documentation for delivering public and private commercial architectural projects. We seek a Project Architect who is organized, can provide technical direction, and leads multiple projects from conception to completion. He/she is responsible to ensure the design, specifications, and construction documents meet governing codes, regulations, company standards and standards of the industry. The successful candidate is responsible for managing engineering consultants associated with any project to ensure thorough coordination, quality workmanship, schedule, and budget compliance. Working literacy and capability in Revit is required. Candidates need to be able to work in an office that has a casual culture with a team approach. This is a position for a licensed architect where individuals will be exposed to a variety of projects including institutional [university, library, museum, K-12], student housing, health care, and other commercial projects. The successful candidate will be a thinker/doer/manager, charged with leading the project and undertaking tasks associated with the full range of architectural project delivery, directing project teams of 1-3 members’ work, coordinating with consultants and managing many areas of project delivery, from conceptual design through construction. Matthew Teismann, prinicpal at MKC Architects, has been nominated and elected to the AIA Columbus Board of Directors. As part of the Board, Teismann’s goal is to increase membership and participation from young architects in the AIA Columbus - newly registered and associate level. For more information please visit the AIA Columbus Website here. Earlier this year, Matthew Teismann [Director of Architecture], took an architectural trip to Charleston, South Carolina. Attempting to draw from its rich and storied cultural history, Teismann performed a self-guided architectural tour of the city’s famous and infamous buildings. Spending one week in Charleston, he visited, sketched, and photographed architecture from across the city center. Some of the most compelling spaces in Charleston arise from a historical urban fabric woven together with contemporary interior spaces, usually masked behind rich and textured colonial facades. The complexities of architectural traditions in Charleston span from English colonization, southern [French] traditions, and East Coast modernity. As such, Charleston rests at the confluence of many architectural influences that coalesce into a diverse and rewarding environment. From the cobblestone streets of the old harbour town, we see clear colonial influences [English and French], at small urban scale. One building of such significance is the Old Slave Mart. Constructed in 1859, the building is believed to be the last extant slave auction facility in South Carolina. The unique façade of the Old Slave Mart consists of 20' octagonal pillars at each end, with a central elliptical arch comprising the entrance. The building originally contained one large room with a 20' ceiling. In 1878, a second floor was added, and the roof was overhauled. The Old Slave Mart was established in 1856 by Charleston City Councilman Thomas Ryan, after a citywide ban on public slave auctions made private 'underground' facilities necessary. Slave auctions were held at the site until approximately 1863; in 1865, the Union Army occupied Charleston and closed Ryan's Mart. When Union forces occupied Charleston beginning in February 1865, the slaves still imprisoned at Ryan's Mart were freed. The Slave Mart and other public buildings of Charleston’s historic center are surrounded by wonderfully detailed residential areas that have a unique typology: the Charleston Single House. A single house has its narrow side (often two- or three-bays wide) with a gable end along the street and a longer side (often five-bays) running perpendicular to the street. The house is well-suited to long, narrow lots which were laid out in early Charleston. Although the form can be found across historic Charleston in a variety of styles, the consistent feature is layout. A front door is located on the long side of the house, halfway along the side perpendicular to the street, located under multi-storey porches, known locally as piazzas. This door opens onto a short central hall and staircase. There is one room on each side of the hall, that is, one toward the street and one toward the rear of the house. The result is a building which is only one room wide when viewed from the street, giving the form its popular name. Each floor contained two rooms, and the floorplan was reproduced on each upper floor. The oblique entry, not off of the main street but through an interstitial piazza on the side, is an architectural sequencing that could be used in contemporary projects today. Located along city center streets, however, is also much new construction that pays homage to the historical and architectural context of the city. Tall structures with vertical movement, coupled with set backs and recessed, help carve an urban edge tuned to the local climate. New construction is abundant in Charleston, and these buildings serve to continue the urban history of the city long into the future. Another exciting feature of Charleston is the mosaic of contemporary interior spaces, in particular in bars and restaurants. The use of exposed structure, simple yet rustic materials, and natural warm light create complex yet clean interior spaces as a reposed from the hot, humid south. Simple color pallets and high ceilings, thanks to the historic structures, are as inviting as they are textured. In the hot climate of Charleston, these interior volumes serve as a secondary public realm, continuing the streets and plazas of the city into the building. Charleston offers rich lessons for the contemporary architect, with a variety of influences to draw from. From its historical urban and colonial context, to the public interior, Charleston is an inviting city with architectural stories within its stones. Abstraction & Analysis: A strong design education begins with the ability to abstract and analyze existing works of architecture as well as the skills to evaluate one’s own work. Students in this studio will be introduced to a range of contemporary and canonical works in order to understand the breadth and range of creative production within the discipline of architecture. Architectural Form: This studio views form as a foundational act of architecture. From aesthetics and composition, to digital workflows and design iteration, issues of form will be foregrounded in the design process. 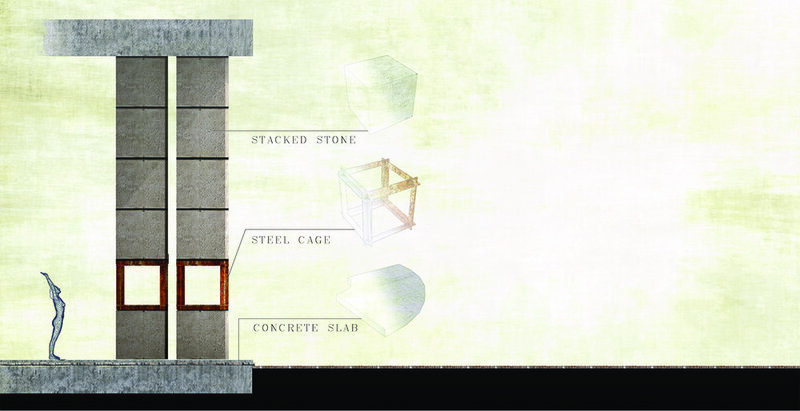 Each project will offer new strategies for creating, advancing, and representing architectural forms. Graphics & Representation: The beginning design student must learn to create clear and compelling graphic representations of their ideas. Representations of architecture should be both accurate and projective. This studio will prepare students for the profession of architecture by building skills in orthographic projection, diagramming, physical and digital modeling, and photography. 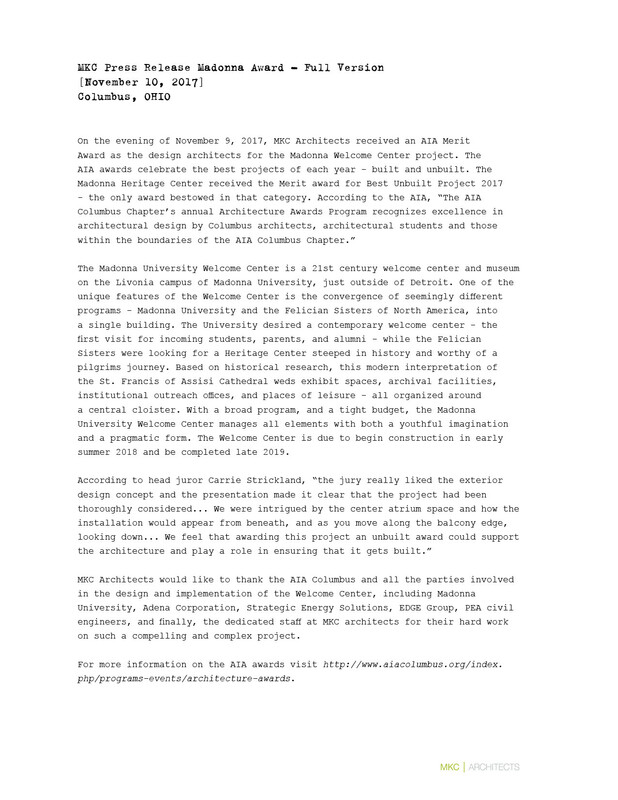 For more information on the Knowlton School of Architecture, click here. In early November, Norton City Schools sent a drone above their high school to take a photograph. Now that the landscaping is completely grown in, the view is breathtaking. 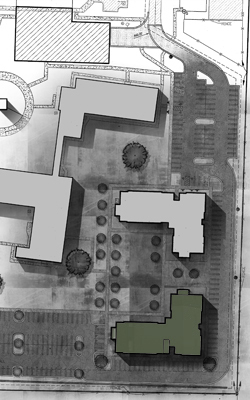 On axis with the football stadium and promenade, this aerial perspective encapsulates the design intent of both the Masterplan and high school. During the week of November 15th, MKC said goodbye to two high-school interns that had been with us during the fall semester of 2018. Megan Rease and Paulina Mudrey were both exceptional and eager students who were able to work on a variety of projects - with a primary focus on interior finishes and spatial planning. Beyond their professional attributes, we found both Megan and Paulina to be funny, considerate, and a pleasure to be around. Their laughs will be missed in our office. Godspeed ladies and good hunting! An in-depth report by MKC Architects shows that the former Central School on East Chestnut Street is structurally sound and worthy of preserving. The preservation price is estimated to be $3.86 million. 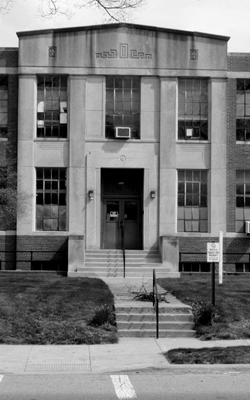 The purpose of the $10,000 study was to give the commissioners a “road map” as to whether to move forward with renovations on the 79-year-old building. For more information on the news article and renovations, please see complete article here. 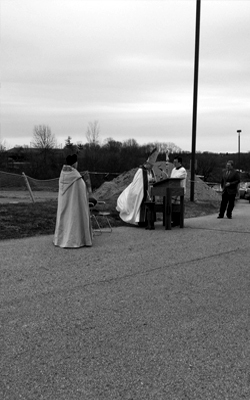 On December 1st MKC Architects attended the special holiday event 'Orange-Line' hosted annually by the AIA Columbus. 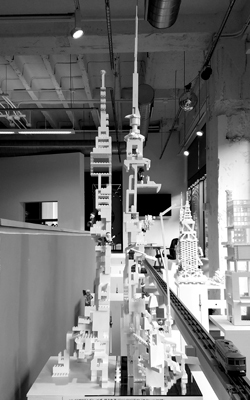 The tallest submission on display, along with 15 other lego highrise buildings, was 'Sophronia,' MKC Architect's proposal that is both city & building inspired by the fictitious city of the same name Italo Calvino. 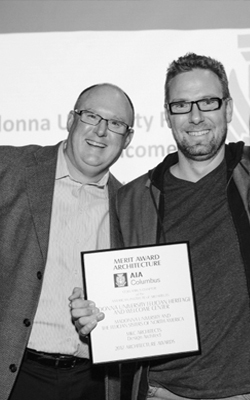 MKC Architects received an AIA Merit Award as the design architects for the Madonna Welcome Center project. The AIA awards celebrate the best projects of each year. The Madonna Welcome Center received the Merit award for Best Unbuilt Project 2017 - the only award bestowed in that category. According to the AIA, “The AIA Columbus Chapter’s annual Architecture Awards Program recognizes excellence in architectural design by Columbus architects, architectural students, and those within the boundaries of the AIA Columbus Chapter.” MKC Architects would like to thank the AIA Columbus and all the parties involved in the design and implementation of the Welcome Center, including Madonna University, Adena Corporation, Strategic Energy Solutions, EDGE Group, PEA civil engineers, and finally, the dedicated staff at MKC architects for their hard work on such a compelling and complex project. For the full press release, including jury comments, click here. Inspired by the Lazurus department store holiday window, the AIA Columbus holds an annual lego competition titled 'The Orange Line: High-Rish Home for the Holidays.' 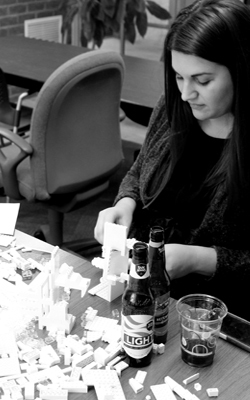 The aim of this event is to showcase creative architectural talent through the use of a uniform palette of white legos. Following the success of last year's entry, 'Graffiato,' MKC will once again develop a submission. Taylor Clune is leading the team to develop a ubiquitous building/city called 'Sophronia,' which references Italo Calvino's fictitious city of the same name. With the iterative nature of the Lego block, the make-up of any Lego City is Sophronian in its nature. The tallest of the towers in Lego Sophronia sits directly on the dividing line of the half-cities, one half addressing the permanent side, and the other in a constant state of change. 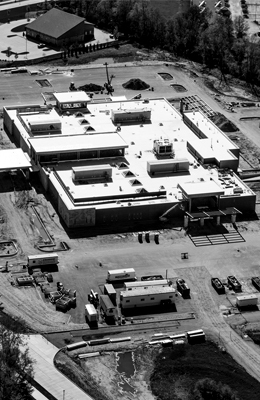 The VA Outpatient Clinic in Mishiwaka, Indiana is nearing completion. The 89,000 sf facility reached Substantial Completion August 21st, 2017 and is scheduled to start accepting patients on September 18, 2017. The $38 Million facility provides outpatient services for veterans and will save veterans from making the long drive out of several nearby counties, including southwest Michigan, to Indiana's much larger VA hospitals in Fort Wayne, Marion and Indianapolis. In addition to primary care the facility will provide an array of services including eye and hearing clinics, foot and skin doctors, cardiology, mental health, etc. MKC completed the project utilizing a design-build delivery method in conjunction with McShane Construction out of Auburn, Alabama.